There are some good engineers working to make IE a better browser. I don’t want to belittle their work, but I couldn’t let go the recent work of various marketing groups this week. First up, we had the the chaps from down under try to buy downloads with 10 grand, ripping into other browsers along the way…. as they use all images and no type in their lovely page. I have found Aussies to be a hilarious bunch, but not so much this time? I can see how the idea would seem good in a meeting room…..
Michael Yoshitaka Erlewine quickly realised that tengrandisburiedthere.com wasn’t taken so built his fun retort for the Mozilla community. 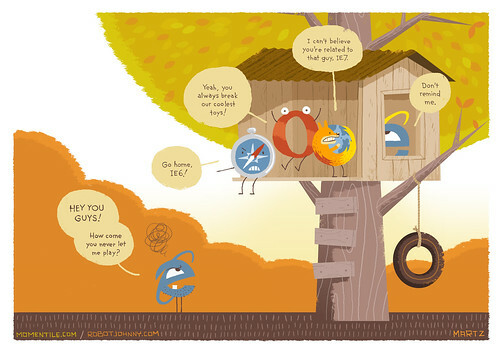 Lately, there’s been a lot of talk about Internet Explorer’s speed, security, and adaptability. But many of the claims are comparing older versions of Internet Explorer to competitors’ newest releases. These pages somehow manage to claim that IE is more secure, is the only browser with privacy features, is the easiest browser to use, has great Web standards support, fantastic developer tools, is more reliable, and customizable, and on and on. They even use their monopoly baggage to claim that all of those annoying “built for IE” pages of the past make IE more “compatible”. Oh, and obviously the performance of IE 8 is vastly superior to other browsers. Sure the “benchmarks” don’t tell that story, but that isn’t what matters. Of course, anyone who has USED THE DARN BROWSERS can get a decent feeling on performance. IE 8 is a decent browser, much better than IE 7 and before it. However, it drives me nuts to see the marketing spin and bare-faced lies that come across here. It denigrates the work that the engineers are doing. Microsoft still treats consumers as morons. Watch out, Microsoft, we are getting smarter. There’s a thing called the Internet, which gives us power. And, with it, we can actually spread the truth, you know? And the truth does ends up prevailing, (t)here. Watch out, Microsoft, you can no longer fabricate the truth with your ads and your marketing, you know? You can use Safari to spoof the user agent to IE8. Let’s hope the EU makes Microsoft provide in Windows 7 for every user, on install, a choice between the 5 main browsers, so that, at the very least, users will stop thinking that Internet Explorer = Internet. Ah, there’s actually a thing called browser. Microsoft doesn’t own the Internet. They have a CHOICE. They can choose the platform of the present/future. They are not tied to Windows anymore. And, Obama, what are YOU doing about this? You mean what Tristant Nitot of Mozilla is doing everytime he speak in public ? This is just a bad campaign, every browser vendor made some, and wi’ll continue. Microsoft hin not an exception. Microsoft, for every lie you tell, 100 new Microsoft haters are born. Pretty soon there will be millions of us. Microsoft, every time you tell a lie, 1000 new Microsoft haters are born. Microsoft, every time you tell a lie, a fairy dies. Zoom out until you see the whole continent. Then double click until you find the 10.000 :) Try and you will see. The thing is, these claims aren’t total lies. Maybe just a bit manufactured to make IE8 sound better compared to rest. By the way, funnily enough, nobody seemed to care when Apple was spouting lies about Safari… “Safari is the first browser with X” even though they weren’t but I sure don’t remember seeing a post on Ajaxian about that! @RoryH: That explains a lot! Damn. I got back from my holliday just in time to have a great laugh over this. The get the ‘facts’ page proves that Microsoft still has *no* *clue* whatsoever as to what IQ their users have and how far it will backfire on them. It looks like they modified the site since they’re not blaming me anymore for using ‘old dull firefox’. I think more people have pointed the creators of the site of their ‘professional approach’ of this action. This is just ONE metric, we could also have talked about e.g. IE8 was a *decent* browser, it still doesn’t hide the fact that it’s still several orders of magnitudes number of paradigms behind *ALL OTHER BROWSERS* in this world…! So your statement isn’t just “unfair”, it’s also blatantly out righteous *DANGEROUS*…! How many years have we been waiting for CSS 2.1 support in IE? Good comment about the DOM layout improvements though. Erm…doesn’t that involve working on w3c spec applications? Isn’t that the problem we had with CSS 2.1 support? @Joeri, a page that takes almost the same time and once loaded its responsiveness is 5 to 50 times slower than any other browser is more than significant. If you leave in 90s where JS was only that “unknown language used only for some form” I think you should update your self up to 2009, where again we are all stuck because of lacks caused by Internet Explorer. Their blog is talking only about accelerators, and JSON was a truly simple thing to implement in core … I mean, there is already a parser working there, it was not that big effort, wasn’t it? defineProperty is partially useless because not compatible with every object, just DOM nodes and Window ( better than nothing ). Tell people that IE8 is the best browser out there is a lie. Underline CSS 2.1 while WebKit and others are moving forward with 3 plus personal proposal, means IE 8 is again behind the scene. Avoid canvas, HTML 5 elements will block us for dunno how many other years, unless we do not fall back. Sure, the best bench ever is the load speed, cause a millisecond means a lot, as we click a page each millisecond, rather than enjoy an advanced website for minutes/hours, right? You should look intensive application via GWT, Ext JS, YUI, and compare their responsiveness with this fantastic IE8, the first thing you’ll do as developer is to swear against a lot of saints. “Face The Reality”, rather than “Get The Facts” with “kiddish, gne gne style” blames, IMHO. And that’s the problem. There are still a lot of people running IE6. Who is running an Opera or Firefox or Safari or Chrome of that vintage? Chrome autoupdates. If only IE did. What does it matter if IE8 is great if we have to code to IE6? Just more of Microsoft’s total lack of self-awareness. Name a browser that can scroll as smoothly as IE6. (Other IE versions went downhill scrolling-wise and Firefox doesn’t count on account of the fixed background bug). This and lack of various addons are the only things keeping me off Chrome atm. Hmm, let’s see… If, according to Microsoft, Firefox is “old”, then, what’s Internet Explorer? Dead? My professional opinion is that Microsoft is dead. and sadly that quote is exactly right, because IE8 is closer to IE7 (or even IE 6) than firefox, safari, or chrome. That is truly how far behind IE 8 is, it isnt even in the same ballpark as the other A-grade brosers so its “closest competition” are the weaklings IE 6 and IE 7. I like that image. Microsoft finally admits being the frog, where the others are princes. I guess Microsoft ain’t a total lier after all, eh? Microsoft Evangelist [seemingly nervous]: What’s that?! Internet Explorer with a new logo? Then this Microsoft Evangelist laughs of his own joke. This moment, to me, told me more about Microsoft that a thousand magazine articles. BTW, a few months later, that developer was no longer at Microsoft. – Microsoft, roll over and die! – Microsoft, roll over and lie! MS: Drop support for IE 6 and 7 now. When you do that, I can tell my clients that I can’t support it either. It gives me the ammunition I need to finally write web apps without tearing my hair out and wasting countless hours making your old crap work. At that point, I’ll evaluate IE 8. Until then, “IE” is IE 6, 7 and 8 in my (real) life. Ahem. I’ve actually just spent 6 months building an ExtJS web app, developing on firefox 3 with regular testing on IE8 and chrome. I’m not saying there isn’t a performance difference, just that it isn’t this ground-breaking earth-shattering chasm that I keep hearing here. IE8 is “good enough” performance-wise from what I’ve seen from it. Maybe it’s just due to the sort of app I’ve been building (iGoogle-style gadget portal). We’ll see what my experience is when I move over our room reservation system to ExtJS. @Joeri, complex web apps via Ext JS is my daily work. Big differences between IE8 and 6 via Ext? Nothing compared with the feeling you can have via Chrome, for example, or others. The reason IE is reasonably responsive in IE as well is that Ext JS team put a lot of effort to make IE sufficiently fast. Still, when things become more complicated and you use complex personal gadgets/logic inside some Ext floating window, take the chronometer and check he difference: Internet Explorer is slow! The browser for today web tasks? Just have a ride in TaskSpeed and see, even with a partially bugged document query selector how slow is, generally speaking, IE … and for general daily basis tasks. Is version 8 better than 7 ? HOPEFULLY!! !